What an exciting time for you as you prepare for your marriage! This is a special occasion that will hold memories for you for the rest of your life and we are here to help you get started! The preparation for celebrating this sacrament consists of PREPARE and Pre-Cana sessions. Add the following to your "to do" list and get started asap! 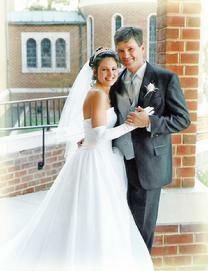 Contact our wedding coordinator, Maria by email or call the parish office at 410-742-6443. She will help you with all of the particulars and keep you on track as to what has to be done here in the parish. Call the parish office, 410-742-6443, and make an appointment with one of our clergy. We will need to complete paperwork asking permission for you to be married in a parish other than your own. You will also need to complete your PREPARE session online after your appointment with a priest or deacon and attend four Pre-Cana sessions. Call 410-742-6443 to register. Call the parish office, 410-742-6443, and make an appointment with one of our clergy. It is possible for a Catholic to marry in another Christian church and have the marriage celebrated as sacramental. Paperwork will need to be completed and permission granted. You will also need to complete your PREPARE session online after your appointment with a priest or deacon and attend four Pre-Cana sessions. Call 410-742-6443 to register.